Sours seem to be the new big thing in the beer world. In Eastern Iowa we’ve seen a handful of this style. 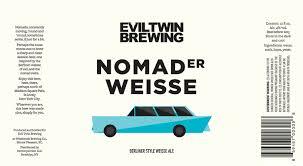 Big Grove in Solon is making some terrific sours, Destihl has cans and draft show up sporadically and now Evil Twin has given us Nomader Weisse. Now, I was in the dark when it comes to the difference between a gose and berliner weisse, but I believe the difference, and please correct me if I’m wrong, is a Gose style beer is more on the salty side and a berliner weisse is more tart and is obviously made with wheat…could be wrong, but that’s the interpretation I got. Anyway, this brew was given to me by a buddy at work who has become a fan of the gose/berliner weisse beers as well. He found it at Oakland Road Hy-Vee in Cedar Rapids, and I haven’t seen it anywhere else. Although it’s available now it would be an ideal beer for the spring and summer months. This beer is much more tart than a gose, but there is some salt as well. A bit of sweetness from the wheat and some funk and a bit of tropical fruitiness. Glad to see this in cans as well and once again, a perfect session beer. My only problem is that with multiple sours for the Baron comes the awfulness that is acid reflux..but that’s why tums are made, so I drink this brew! I’m not sure on the release schedule of this beer but I would love to see it again this spring and specifically a few of these for opening day for my Dodgers. POUR: Hazy golden pour with a medium white head. AROMA: Lemon smell with a bit of malt. TASTE: Lemon/citrus flavor with sweetness from the wheat. You get the vinegar/brine as well. My recommendation: If you need your sour fix this is definitely the beer for you. Tart as can be with a bit of saltiness. I hope to have more of this in my fridge for March Madness going into MLB opening day. Dodger dog and this beer would be just perfect.